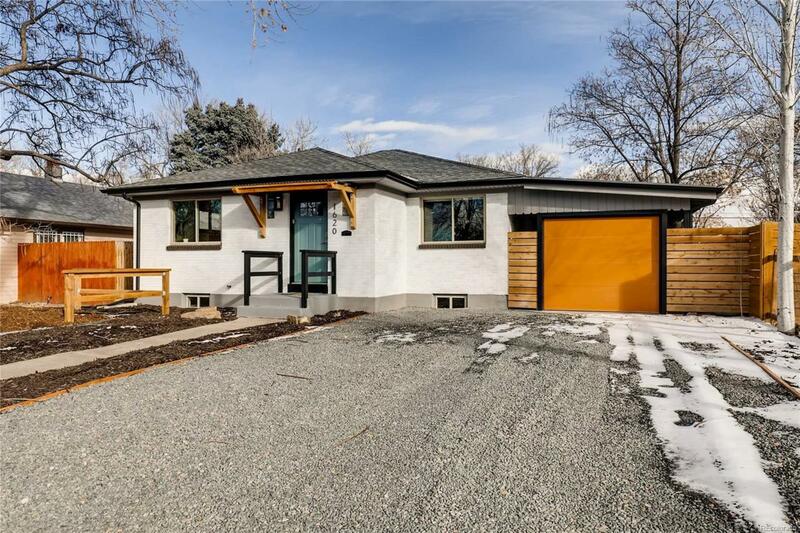 MAGICAL East Denver remodel! This ranch offers undeniable curb appeal and a fabulous layout! Contemporary/modern finishes greet you at the front door. A stunning entry bench and glass barn door coat closet help keep on those winter accessories tidy. A huge living space and functional updated kitchen are separated by a super cool industrial metal railing. The main floor offers AMAZING entertaining options as well as 2 bedrooms and and bright remodeled bath with double sink vanity. Sliding patio door takes you to a HUGE backyard with brand new sod and patio area. Another door takes you to the carport/garage/covered patio space! Downstairs youll find brand new carpet, another updated bath, two beds with egress windows, large laundry space, and HUGE family room! Movie theatre? Workout space? You decide! Loads of closet space throughout the home. GREAT location-minutes to Stanley Marketplace, Stapleton, Lowry, Fitzsimons. 10 minutes to downtown. This one is a real stunner!